General Electric Co. (GE - Get Report) has been a dumpster fire. That much has been true for a while now. The stock is down about 60% over the past 12 months and is lower by almost 80% since the start of 2017. The one who predicted it all? JPMorgan analyst Stephen Tusa, who recently upgraded the stock to hold from sell but maintained his $6 price target. That caused a temporary spike in GE, but shares are now down near $7, threatening to retest to the lows. Earnings, cash flow and a massively underfunded pension fund have many investors worried about the long-time industrial stalwart. While GE was once a dividend-paying industrial titan, it's clearly lost its way. Even after halving its dividend in November 2017, GE was essentially forced to abandon its dividend, cutting it down to just a penny per share in October 2018. Balance sheet issues? Check. All-but-eliminated dividend? Check. At this point, investors are at a loss on what to do. It's clear that GE stock remains too risky for retirement accounts, at least from a single-stock perspective. No longer can we depend on its cash flow or its quarterly dividend pay out. Its valuation has done nothing to keep its stock price from falling. Investors who want dependable income from industry stalwarts should consider names like PepsiCo, Inc. (PEP - Get Report) or Johnson & Johnson (JNJ - Get Report) (even with its baby powder drama). GE has made moves to shore up its issues. It brought in a stud of a CEO with Larry Culp, formerly with Danaher (DHR - Get Report) . It cut its dividend, which will help stem some of its cash flow issues. It's also resorted to asset sales, albeit not necessarily at the best price. Still, this helps the balance sheet and is one of several painful-yet-necessary moves the company needs to make to get back on track. Now that GE's got Tusa turning less bearish (although only slightly), GE's on its way to re-earning the trust of shareholders. What it absolutely must do now is stay above its recent $6.66 low from earlier this month. 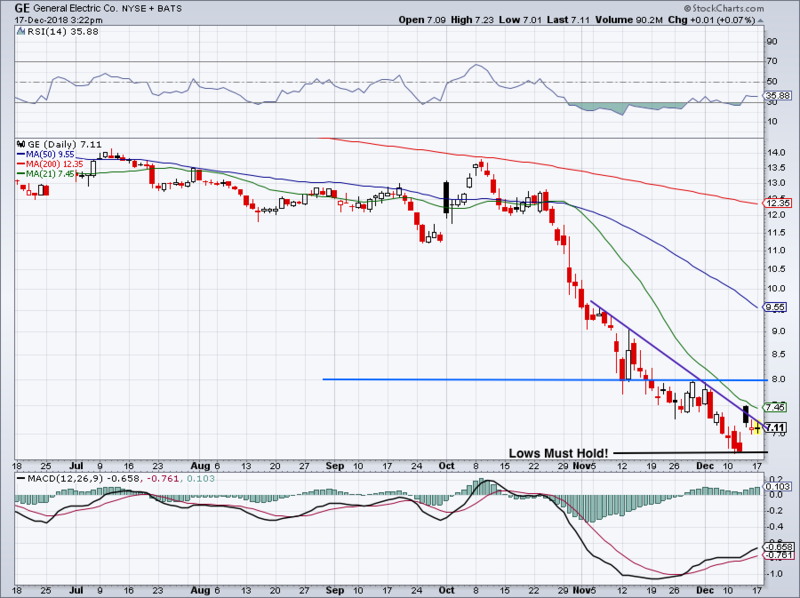 Preferably shares will stay above $7 and allow the name to put in a series of higher lows. But at they very, very least it can't make new lows. If it does, that opens the floodgates to $6 and below and may keep a lot of investors out of the name. Johnson & Johnson and Danaher are holdings in Jim Cramer's Action Alerts PLUS Charitable Trust Portfolio. Want to be alerted before Cramer buys or sells JNJ or DHR? Learn more now. Can we enhance its performance? We can, and one way to do it is with options. However, options use leverage, which not only means more risk, but also more difficulty in timing the trade. That may not fit in with some investors' risk profile. But for those who it does, it can be a great way to make up some of these losses. For instance, those looking to add to their position or initiate a new one can consider selling cash-secured puts at lower strike prices. Should GE continue to fall, those put-sellers will be exercised at lower prices. If the stock stabilizes and/or rallies, they will get to keep the premium they collected for selling those puts. Another strategy for when the eventual bottom does come to fruition -- be it at $5, $6 or whether it already has -- investors can look to get long GE via deep-in-the-money call options. Requiring just a fraction of the capital that is required to buy 100 shares of GE common stock, investors can load up on the name and ride a strong rebound in the industrial giant. One disadvantage to this strategy would typically be missing out on the dividend, but given that there's hardly one to collect, call owners aren't missing out on much. Should the rally sustain and GE go on a multi-month rally, this strategy could net investors big-time profits. Only time will tell, though, as to when that bottom will come. Next month is a possibility. GE reports earnings in late-January.